Mirrors/Cosmic is an installation that explores the idea of fantasmagoria; where projection, smell and sound are used in a space to create illusions. The work began with the idea of creating a space that mimics my photographic practice of making still lifes from organic and plastic synthetic amalgams. The installation skews perceptions and delves into the mystery of the ordinary and how the familiar has the potential to become strange. 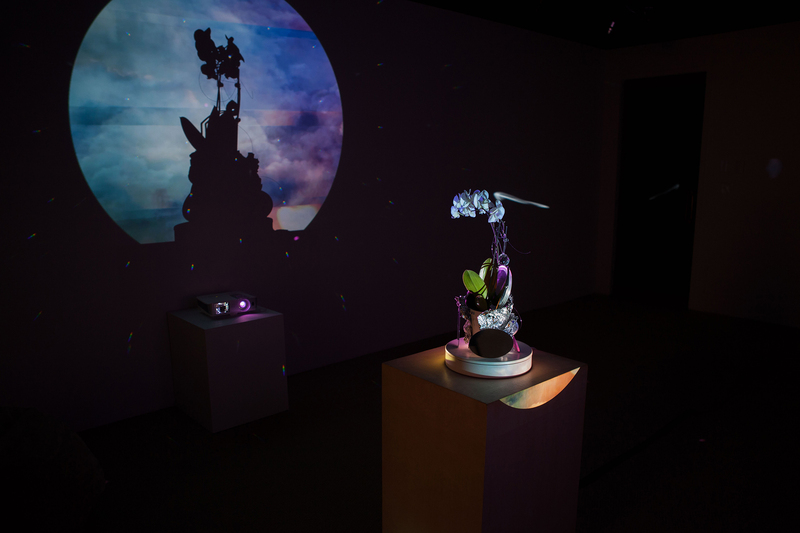 The main focus of the installation is an orchid rotating in the middle of a dim room. The only light source is from two projections of digitally montaged skyscapes. These projections transform the orchid, but only superficially. They are insufficient light sources to sustain it. There is also a tension between the orchid and silhouette. 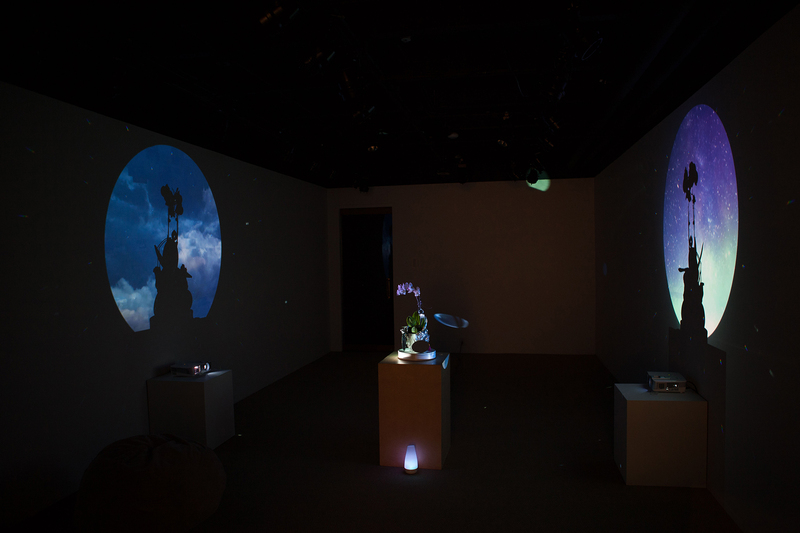 The silhouettes on the projected skyscapes brings the orchid to a new scale, a semblance of the original. 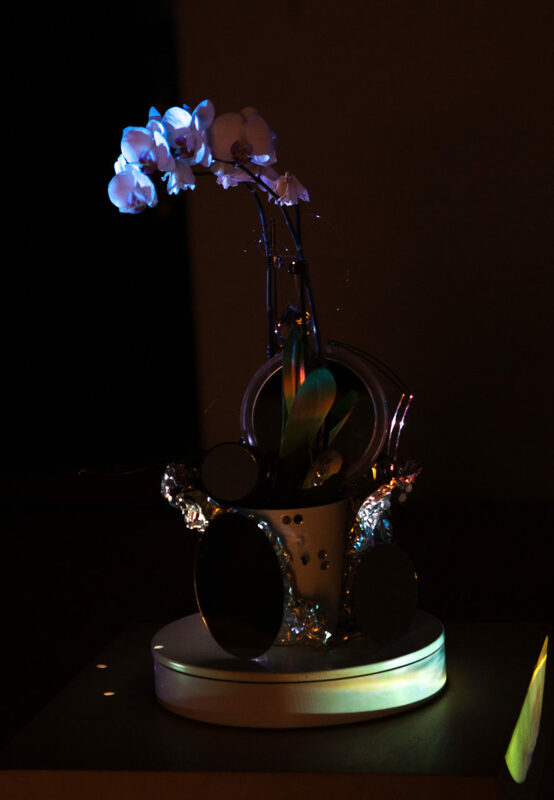 Multiple reflecting surfaces accompany the orchid’s rotation creating refraction that lends a celestial quality to its synthetic universe. The repetitive trance-like nature of the visuals is enhanced by the sound of the motorized turntable, the electronic humming from speakers that are dispersed throughout the space and calming incense of the oil diffuser that is located in the center of the room. With all these things combined, the space becomes a quiet meditative space, one that creates a relationship between technology and spirituality.